I saw a recipe in my Facebook feed the other day that I knew I had to try. It was for White Chicken Enchiladas and it looked so yummy. Funnily enough, turns out I have made this before, from a recipe sent to me by a dear friend last year. But I didn't know that until today, when I double-checked my recipe binder (oh yes, I have a recipe binder!). 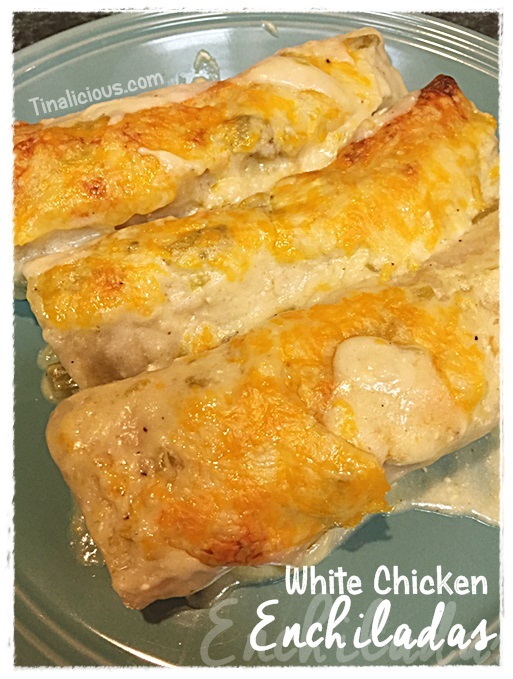 Anyhoots, I was anxious to make these enchiladas. And lets face it: I love me a recipe that is packed with cheesy goodness. I've got the hips to prove it. I made this recipe over the weekend, and it was delicious! So of course I'm going to share it with all of you, too. I'm sure not gonna keep all these calories to myself, ladies. If I'm eating them, you need to eat them too. But trust me, you'll be glad you did. Cook/shred your chicken breast and mix it with the 2 cups of shredded Monterey Jack cheese. Lay 8-10 tortillas out and fill each one with the chicken mixture. Roll them up tightly and put them in a greased 9×13 baking dish. In a saucepan, melt the butter and then add in the 3 TBSP of flour. Mix and cook for about one minute. Don't overcook--you don't want it to turn brown. Add in the 2 cups of chicken broth, whisking until it’s a smooth consistency. Whisk over medium heat until the sauce becomes thick and creamy (this will take about five minutes or so). Mix in the sour cream, salt & pepper, and the can of green chiles. Pour the sauce evenly over the rolled up tortillas. Add the 1 cup of the Colby Jack cheese on top. Bake for 20-25 minutes until hot and bubbly, or until the cheese is golden brown. I don't mean to brag much, but the Hubs told me this was one of the best meals I've ever made. He is not one to throw compliments around willy nilly, mind you. And I have made a lot of meals in my almost 32 married years. So that's really saying something. Never mind the fact that I have made this recipe before and he didn't rave about it then. I think it was the cheese variation I made--I added more cheese to the inside of the enchiladas, so they'd be even more cheese-a-licious. And clearly it worked. But you know, don't worry about those extra calories. You can easily get rid of an extras that may land on your hips with just a little dancing. And Tom Hiddleston's hips never lie. Well it's that time again, folks. You know, that time of the week when we're all just standing around a little dazed and confused from the midweek mind melt thinking, 'WTF?!' And since we're thinking that anyway, it's the perfect time to share this WTF Wednesday Teeny Bikini Moment. Now I fully realize that this is America, and we're all pretty much free to wear any damn kind of bikini we want. But in the words of my grandma....just because you CAN do something doesn't mean you SHOULD. And I couldn't agree more. No other words come to mind here. Only one thing fits [and it ain't that bikini]. I'm just me. Artist. Crafter. Writer of rants with occasional wit and wanton sarcasm. And a wife, mom and grandma too. I'm Tinaliciously me.